Mode of Contract: Contracts will be made annually with a probation period of six months. The annual contract will be extendable up to the project period based on satisfactory performance in the preceding contract assessed by the project. 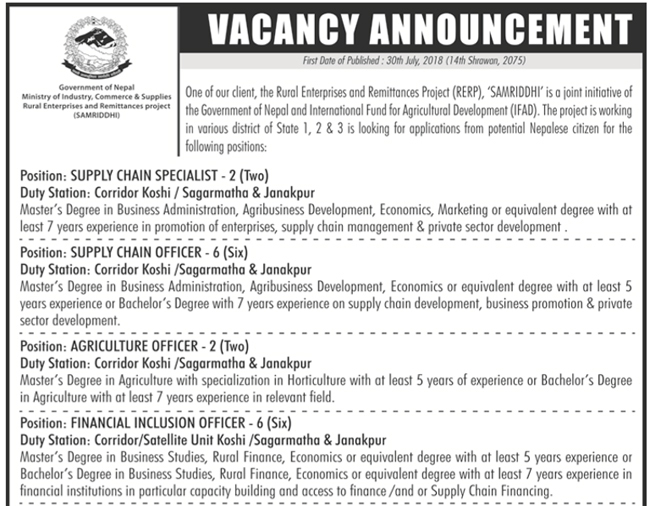 The Supply Chain Specialist, under the direct supervision of Component 1 Manager, will be responsible as technical lead in planning, implementation, monitoring and reporting of both farm /off farm supply chain promotion and development interventions in tandem with other component within the project and ensure effective coordination, management and capacity building of project staff to facilitate and support supply chain actors in strengthening linkages, business planning, investment analysis and other areas that lead to improved performance of the supply chain system. 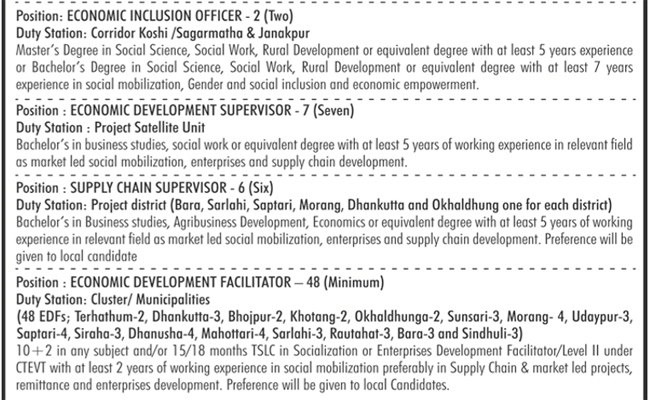 The Supply Chain Officer, under the direct supervision and guidance of Corridor Coordinator and Supply Chain Specialist, will be responsible for implementation of the Supply Chain development interventions in the respective Corridor and to guide and coach Corridor Staff to facilitate and support Supply Chain actors in strengthening linkages, business planning, investment analysis and other areas that lead to improved performance of the Supply Chain system. The Agriculture Officer (AO) will work in the Corridor Office to provide technical guidance and support in planning, implementation and monitoring of agriculture supply chain based enterprises with in the project enhancing competitiveness. S/he will coordinate and support public & private service providers (LRPs, EDF, VAW, VAHW and extension worker) to deliver technical support for improved & sustainable production, post-harvest technologies and marketing activities in the designated agricultural and livestock based supply chains of the project. The Financial Inclusion Officer (FIO) will work in the Corridor Office with overall responsibility and leadership on the planning, implementation and monitoring of the Financial Inclusion sub component in tandem with other components of the project. Under direct supervision of the Financial Inclusion Coordinator and Rural Finance Specialist and in coordination with thematic team members, S/he will work closely with Partner Financial Institutions (Banks, MFI & rural Cooperatives) in developing various financial products and capacity building of rural cooperatives to enhance access to financial services among project target beneficiaries. The Economic Inclusion Officer (EIO) will work in the Corridor Office to manage the implementation of the Project’s field activities and integrate the inclusion objectives of the project into strategic economic development opportunities in tandem with other components and planning. Under direct supervision of the Economic Inclusion & Gender Expert and in coordination with thematic team members, S/he will provide support, guidance and supervision to Economic Development Supervisor and Economic Development Facilitator for overall implementation of project field activities effectively in inclusive manner. The Economic Development Supervisor will work under the corridor office being in Satellite Unit to support the implementation of the project’s field activities through providing technical and strategic support to Economic Development Facilitator and enabling an effective flow of information from field to inform the planning activities of the Corridor Office & overall RERP. S/he will work as a field supervisor/coordinator under the direct supervision of the Economic Inclusion Officer in respective Corridors offices. S/He will work with close coordination with thematic team of the project and under administrative guidance from the Corridor Coordinator of the project. The Supply Chain Supervisor, under the direct supervision and guidance of Supply Chain Officer and Supply Chain Specialist, will be responsible for implementation of the Supply Chain development interventions in the respective district and to guide and coach Economic Development Facilitators to facilitate and support Supply Chain actors in strengthening linkages, business planning, investment analysis and other areas that facilitate to improved performance of the Supply Chain system. Number of Positions: Minimum 48 Nos. 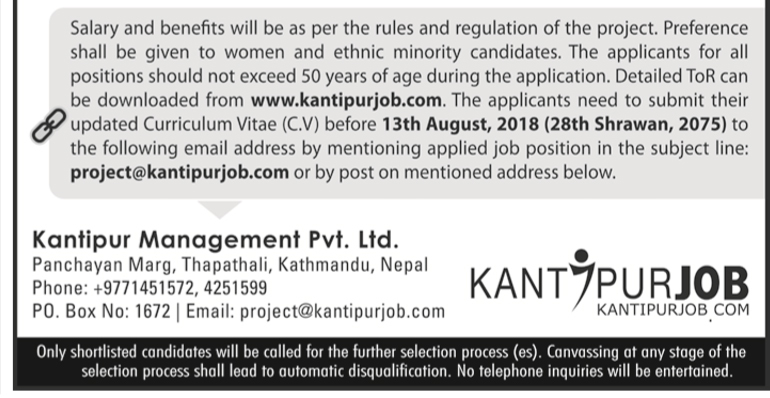 with subject to increase in number as per project coverage expands and successful candidate will be fulfilled from merit list. The Economic Development Facilitator (EDF) will work under the Corridor / Satellite Unit to support the implementation of the project’s field activities in particular social mobilization (inclusion of poorer households, migrants’ families and returnees’ households), business facilitation, enterprises promotion and linkages; S/He will also work as field facilitator under direct supervision of the respective Economic Development Supervisor with coordination of Economic Inclusion Officer (EIO) from the project’s corridor unit.